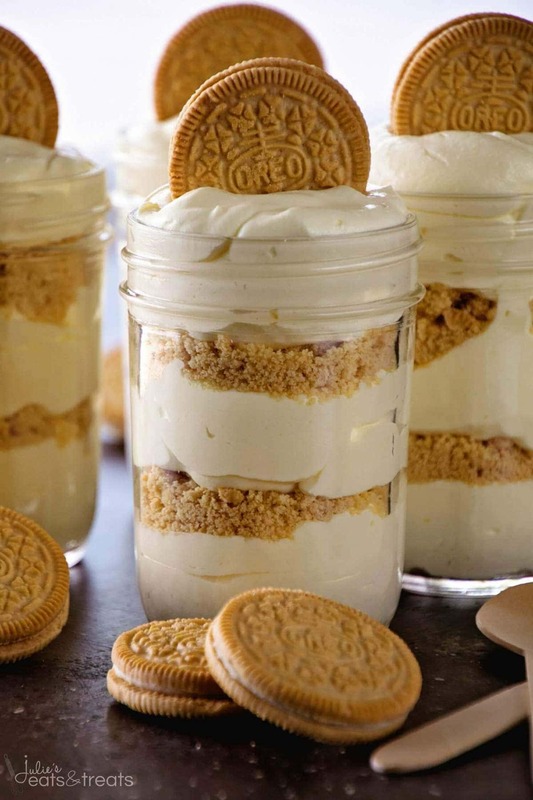 Golden Oreo Dream Salad ~ Layers of Delicious Crushed Oreos and Light Fluffy Pudding! 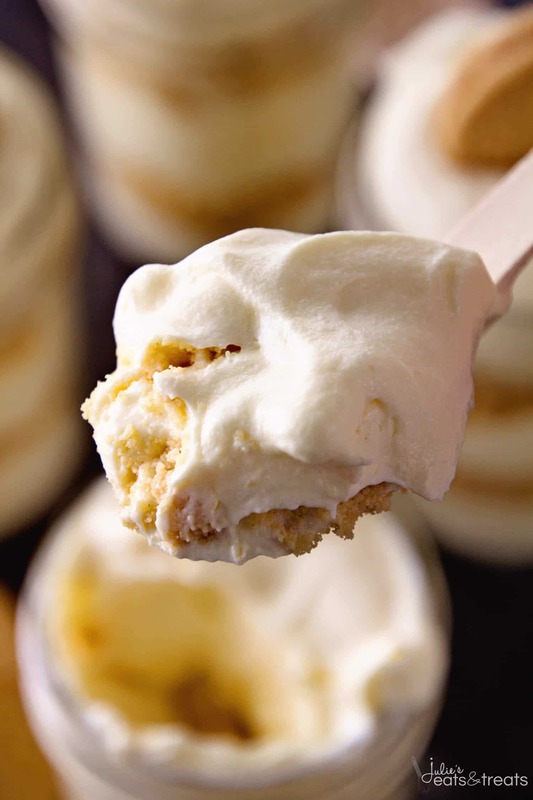 Make it in a Mason Jar or Trifle Bowl! Perfect for Picnics! Being a mom comes with a whole lot of duties. I found out a new one on Saturday when I was making this. My new one is hiding downstairs with my blender while Miss K sleeps on the floor upstairs. I have quickly learned that you will do ANYTHING not to disrupt a sleeping baby. Anyone else been there before? 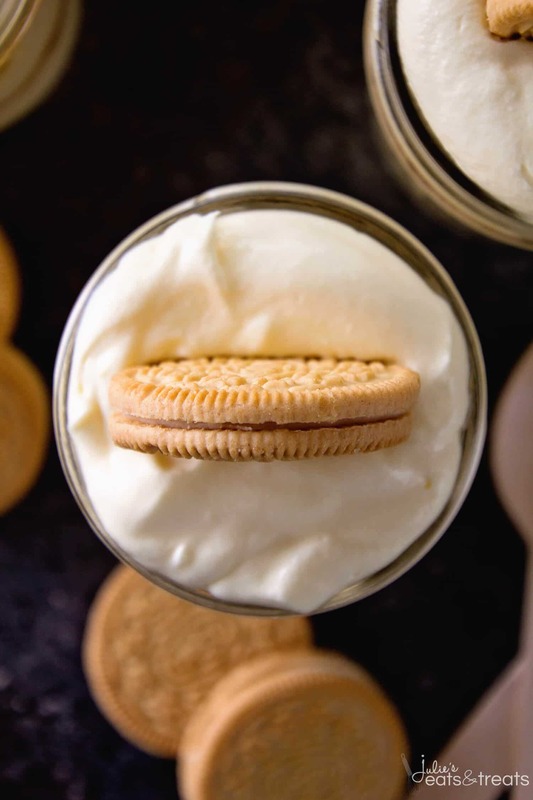 Even though I may have blended my Oreos in a laundry room this still turned out AH-MAZ-ING! Plus how do I call myself a “food blogger” and I don’t even own a food processor? I really think I need to invest in one of those…. What’s with calling a calorie laden delectable dish a salad anyways? Is it our way of making us feel less guilty about the indulgence? Hey if it works I’m all for that! This fabulous little “Salad” will be the star of your dinner so go out there and make it now!! Layers of Delicious Crushed Oreos and Light Fluffy Pudding! 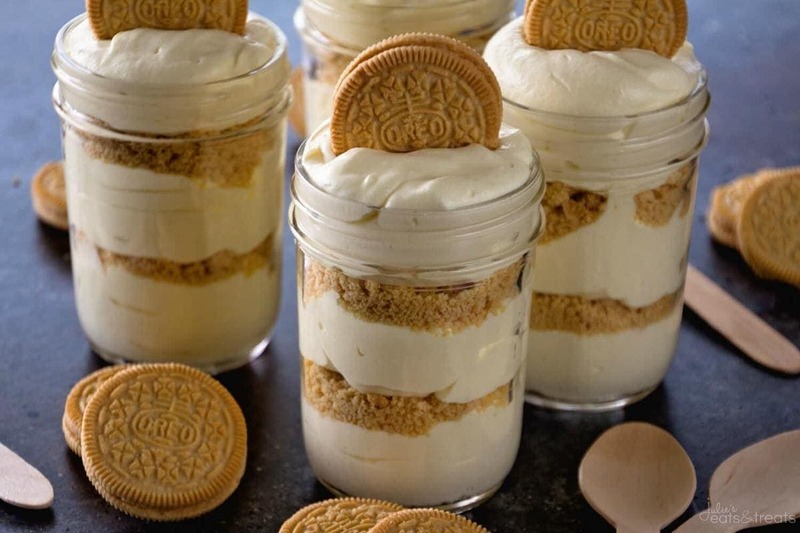 Make it in a Mason Jar or Trifle Bowl! Perfect for Picnics! Cream together the cream cheese, butter, powdered sugar and vanilla. In a separate large bowl mix milk and vanilla pudding. Chill until set. Fold in Cool Whip. Add cream cheese mixture. 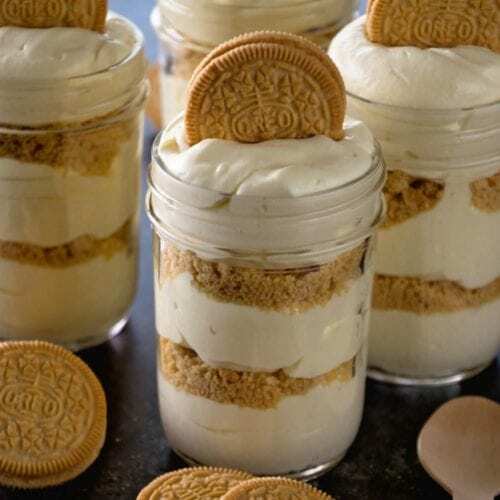 Layer pudding mixture then Oreos, alternating until done. Chill until ready to serve. Layered Strawberry Salad ~ Light and fluffy layers of Strawberry Jell-O! Always a crowd pleaser! 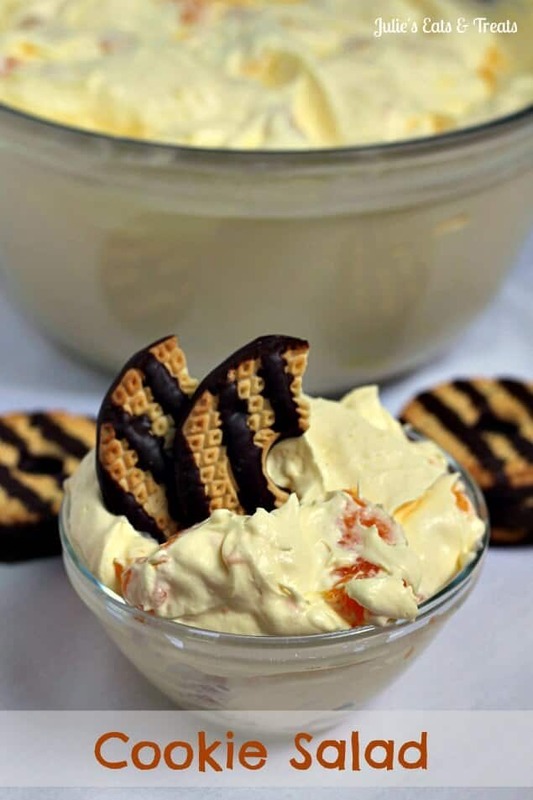 Cookie Salad ~ A tried and true family pleasing salad! 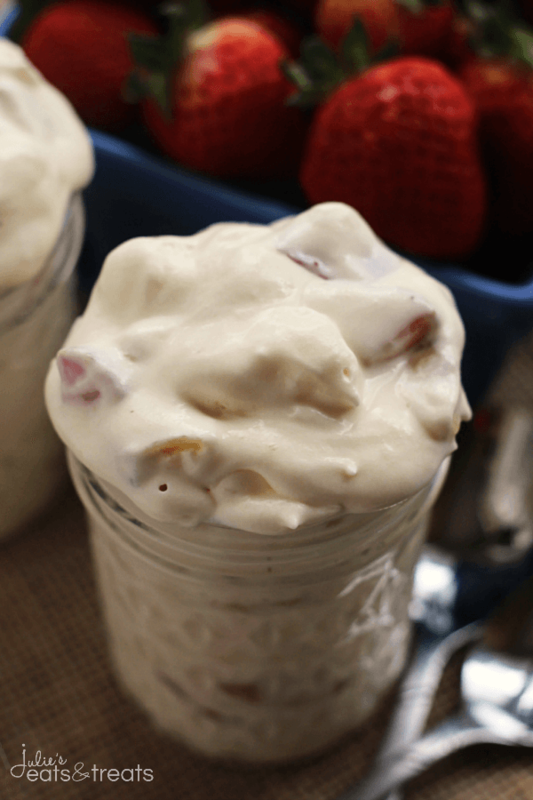 Strawberry Banana Pudding Fluff ~ Light, Fluffy Pudding Loaded with Fresh Strawberries, Bananas and Marshmallows! Yeah, “salad” doesn’t seem to do this deliciousness justice. I would call it a parfait or trifle. Either way, looks yummy! My name is Karly, and i have a Golden Oreo problem. There. I said it. Okay, now I can proceed to obsess over these adorable desserts. I love these so very much, and cannot wait to give them a try! Yum! Anything with Oreos sounds amazing! Love this idea! I will make this splitting between the chocolate and vanilla Oreos. I can’t imagine but I have one granddaughter that doesn’t like chocolate. My husband isn’t a big fan either. Who are these people?! HAHA! I made this for a party, they taste great! For anyone wondering, this recipe makes about 25 individual 5oz servings. I used two packs of Golden Oreos and have about a cup of the “sand” left over.